The entire six-state New England area is ripe with a fast-paced hustle and bustle, and virtually no other section is fraught with heavy traffic more than Boston. Sadly, navigating the Boston roads can be detrimental with just a tiny amount of distraction. Of course, there are many ways to avoid distracted driving, not only in Boston but anywhere in the United States or the greater New England area, specifically. 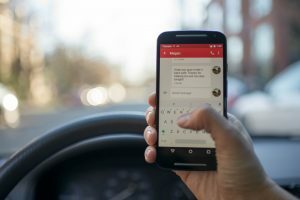 Nevertheless, we are not talking about simply putting the phone down, (although that is consistently the primary cause of distraction these days) but let’s dive a little deeper into the issue of distracted driving in Boston. Without a doubt, distracted driving now leads to more motor vehicle accidents than anything else. So first and foremost, we must discuss the main distraction – phones. More car accidents happen not only in Boston but everywhere else around the globe because of people driving while texting, checking emails, social media notifications, and other reasons pertinent to their handheld devices. The state of Massachusetts employs an “X the Text” rule that is well founded, though it barely works. According to the percentages, traffic-related deaths have jumped since 1990, and of course, a large portion of these are due to distracted driving. Be they pedestrian, bicycle, or strictly motor vehicle accidents, the rise of handheld technology has quite literally paralleled the rise of deaths due to distracted driving. In 2016, crash statistics increased at an absolutely incredible rate, although, it is ridiculous to say that there is only one form of distracted driving. At the Law Offices of Jeffrey S. Glassman, we understand the vast multitude of different causes for distracted driving. We realize that sometimes what you did may or may not be a clear-cut case of distracted driving and that when you are deemed to be at fault, it might not be because what others think it is. No matter what, if you have been in an accident that involves distracted driving of any kind, your safest bet is to call 617-367-2900 to discuss your case in more detail today!